"I’ve started using Ariel for washing the clothes. Sarah’s children have eczema and she says it’s much better for their skin and we have sensitive skin so I thought I’d try it though it’s a little more expensive." "You’re listening to Five Live breakfast with Nicky Campbell and"
"It doesn’t hurt to give it a go does it? I spoke to Melanie about"
"Shelagh Fogarty. In the studio we have"
"Mum and she said she’s being very difficult. She won’t talk as it’s"
"Sheila to tell us about RBS. They’ve announced their quarterly figures which are"
"about Nana and you know what she’s like. She won’t acknowledge"
"a pre-tax loss of 44 million pounds which is round about"
"what the doctor says, or take her medicine when she’s supposed to. Which is just"
"…what we would have expected." And it’s not such a bad place to go. 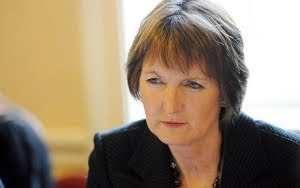 What’s up with Harriet Harman? I was rather troubled by an interview I heard last week in which her argument for future leadership of the Labour party, thinly disguised as a presentation of the ‘equality’ bill, was “either you agree with me or you’re a sexist egotistical pig”. Well it was something along those lines. Most politicians tend to paint the world in broad colours, it’s when they deal in absolutes that we ought to worry; and this isn’t the first time Harriet has indulged in a little rabble-rousing. Not so long ago she suggested Fred Goodwin, disgraced former chief executive of RBS, “shouldn’t count” on his pension, deliberately giving the impression that the government would intervene despite knowing they couldn’t. It might have been popular but the law, after all, is the law; much as Harriet might like to ignore it, which is odd since she’s a solicitor. We know that inequality is grounded not just in gender, race, disability, age and sexual orientation, but also by class. Whoa… full house! Is it possible our wannabe leader is living her political life in reverse? Inequality of opportunity exists in many of these areas, and has blighted far too many lives, but perhaps someone could remind me just how long this champion of the working class, this Labour party, has been in power? Upper and middle class socialists such as Harriet spend more time agitating over class than any other people I know; you’d have thought they could have managed an effective law or two by now.